A guided introduction to wholesale and an opportunity to exhibit at the New England Made (NEM) Spring Show in Portland, Maine at a reduced cost. NEM draws more than 2,000 buyers from across the country and provides a primary showcase for New England-made businesses. NEM buyers are eager for new products! MCA is an established exhibitor at NEM and buyers look for our mentor booth each year. The MCA offers a guided introduction to the wholesale experience for one Professional-level member, preparing one artist each year for the New England Made Spring Show. The MCA NEM Booth Program offers a reduced cost space, subsidized wholesale workshops, booth development and wholesale paperwork design assistance. The selected artist enters into an agreement with the MCA to prepare for the NEM Spring Show and meets deadlines for completion of booth design, line sheet, show card, booth poster/signage, wholesale workshop(s) and marketing materials. In return, the MCA subsidizes part of the booth fee and wholesale workshop fees, and provide guidance from mid-September through the March show dates. Participants must be MCA members at the Professional level and have some experience showing and selling their work in a public setting. No previous wholesale experience is required, but interested artists should have retail/craft fair experience. Preference will be given to artists who have an established business and aspire to make a living from the sale of their work. Applicants for the 2020 program should send an email to dorothy(at)mainecrafts(dot)org by midnight, September 6, 2019 with the subject line NEM Booth Program Application. 1. Tell us about your business in three sentences or less – give us your ‘elevator speech’. 2. Describe one of the products you would like to introduce to the wholesale market. Tell us why you think this product makes sense for wholesale. Include considerations of cost to produce, market appeal, originality, and other factors you feel are relevant. 3. Provide your website address where MCA can view your work. MCA may invite artists to apply based on a feeling that they may be a good fit for the program. MCA will select one artist from applications received by the deadline. Phone call with MCA, who will provide program dates and deadlines and establish an agreement with the artist to complete booth preparation. 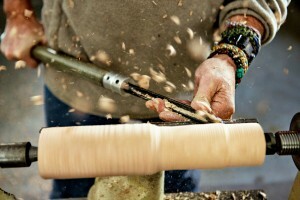 James McLaughlin is a Portland-based artist and owner of 33 by Hand. 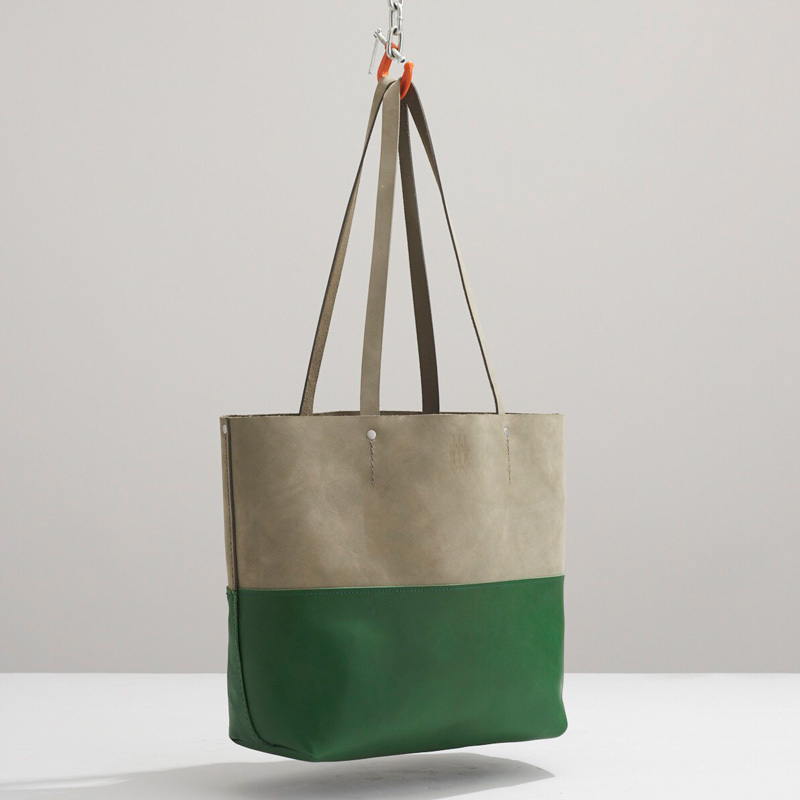 He creates hand made everyday and lasting accessories primarily in leather and canvas. Through a past life as a recording engineer and music producer in Vancouver, BC and Los Angeles, CA, James always held a deep passion for visual and three-dimensional work of all kinds. He established 33 By Hand in 2015, offering high quality, made-to-order leather products with a focus on forward-thinking design. During this time he also worked with Black Point Mercantile, crafting hand painted canvas floor coverings and bags. After leaving BPM and running 33 By Hand for a year, he took a position in the research and development/design department at Hyperlite Mountain Gear in Biddeford, Maine. Anna Low’s passion for book-binding was born in college, where she studied photography and art education. She makes sturdy inviting blank books and limited edition artists books in her one-woman Auburn, ME home studio. Her signature buttonhole binding is one of her favorite ways to stitch together a book – the exposed spine sewing uses no glue and is both decorative and functional. Low’s books have rigid cloth covers and heavy paper that hold up to all types of writing and drawing, and lay open flat without breaking the spine for ease of working. Her collections include accordions, accordions with pockets, coptic bound books with recycled covers, and ‘funky notebooks’ made with ‘stuff that had another life’. She believes that every book she binds is an ongoing collaborative art project between the artist and the viewer/writer/artist who fills its pages. A native of Ghana, Ebenezer Akakpo of South Portland, ME earned diplomas in Jewelry Design and Stone Setting from Le Arti Orafe in Florence, Italy before moving on to the Maine College of Art (MECA) for a BFA in Metalsmithing and Jewelry. A deep-seated desire to solve problems through art led Akakpo to pursue an MFA in industrial design at the Rochester Institute of Technology (RIT). Akakpo specializes in using 3D computer modeling and rapid manufacturing processes in conjunction with traditional jewelry making techniques to produce work that explores the intersection between technology, the machine and the hand-made. Akakpo & Co creates everyday and wearable products in polycarbonate, wood, felt and metal. Symbols rooted in African culture and Maine identity drive the simple, elegant and modern designs offering both aesthetic and identity-based connections to the work.